I must have been somewhere between 5 and 7 years of age when I proudly announced to my father that, one day, I would be a scientist at NASA or CERN; didn't matter much which. I was fascinated by both the very big and the very small aspects of nature, wherein I intuited the presence of profound, numinous mysteries. I guess my father was both proud and a little amused. He knew he had, intentionally or not, fostered my interest in science by exposing me to it practically since I started talking. Less than 20 years later, my very first real job in life was at CERN; a childhood dream come true very early indeed. My first day at work was something like Alice in Wonderland: colleagues had fun pointing out all the Nobel Prize Laureates that could be seen sitting around us in the canteen during lunch, amused by the expression of wonder permanently pasted to my face. I felt like a child surrounded by giants. I cannot overestimate the impact that period of my life had on me. To a large extent, I am a product of it. Every day at CERN, at least for a while, was magical. I would wake up in the morning and hardly have patience to brush my teeth and swallow my breakfast before setting off to the lab. Meaning enveloped and permeated my life. I was doing what I was meant to do, in the place where I was meant to be. I worked on the so-called 'trigger' system of the ATLAS experiment, one of the two main experiments of the Large Hadron Collider (LHC) project. Our job was to design and program highly specialized computer systems that could automatically decide, in a tiny fraction of a second, whether a subatomic collision detected by ATLAS could lead to new physics or not. If yes, the system would store the data for later offline analysis by physicists. If not, the data would simply be discarded and lost forever. Of course, we had to make sure the system would not discard data that could lead to the discovery of the Higgs Boson! Yet, we had to discard the vast majority of the data, because it was technically impossible to record everything. The challenge implied by these conflicting requirements thrilled me, not to mention the idea of designing computers that could unveil the mysteries of what happens deep within matter. My imagination was set off in a manner I never truly recovered from. Panorama of the ATLAS experiment, open for maintenance. Photo by Bernardo Kastrup, hereby released into the public domain. Eventually, I left CERN to pursue a career in corporate technology development. A young professional, just married and full of ambition, is vulnerable to this sort of temptation. Yet, I don't actually regret having left, for what subsequently happened in my life was also essential for developing my capacity for no-nonsense critical reasoning in less friendly and forgiving environments. But my love for CERN never really waned. I do admit though that, over the years, the way I look upon what is done at CERN has changed significantly. My young self, like many people at CERN, regarded the objects of our investigation—fundamental subatomic particles—as literal little particles. It is true that we couldn't actually detect these fundamental particles directly—they decay into other particles too quickly after being created in a collision, so what we actually detect are their by-products—but I nonetheless regarded whatever hit the layers of detectors in the ATLAS experiment as actual particles. Later, I realized that this idea of 'particles' is merely a convenient fiction that helps us model and predict the behavior of nature: the world works as if fundamental subatomic particles existed in the way we imagine them, but this does not imply that they actually exist in that way. Ultimately, when we say that we see a new fundamental particle what we mean is that we see a computer-displayed histogram of the data collected by the experiment, which is consistent with the theoretical expectations associated with the particle. There are many, many layers of abstraction and inference between the concrete reality of a histogram on a computer screen and the imagined reality of a literal subatomic particle bouncing around inside ATLAS. Nobody ever actually sees any subatomic particle. 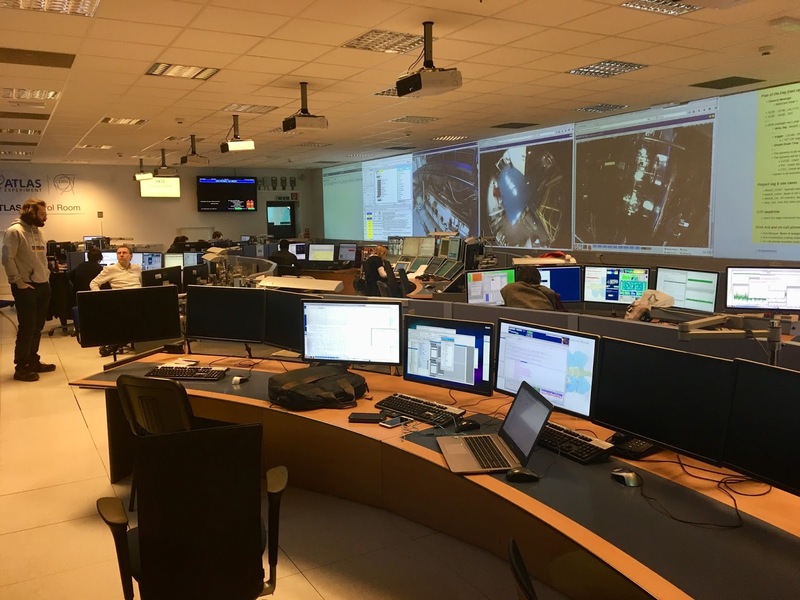 The ATLAS control room. Photo by Bernardo Kastrup, hereby released into the public domain. I confess that this kind of realization fostered, over the years, a little cynicism about the way CERN is portrayed by the media. Often, the whole thing is overblown and even outright fictionalized, despite being presented as fact. Perspective is lost for the sake of an unsubstantiated kind of romanticism. 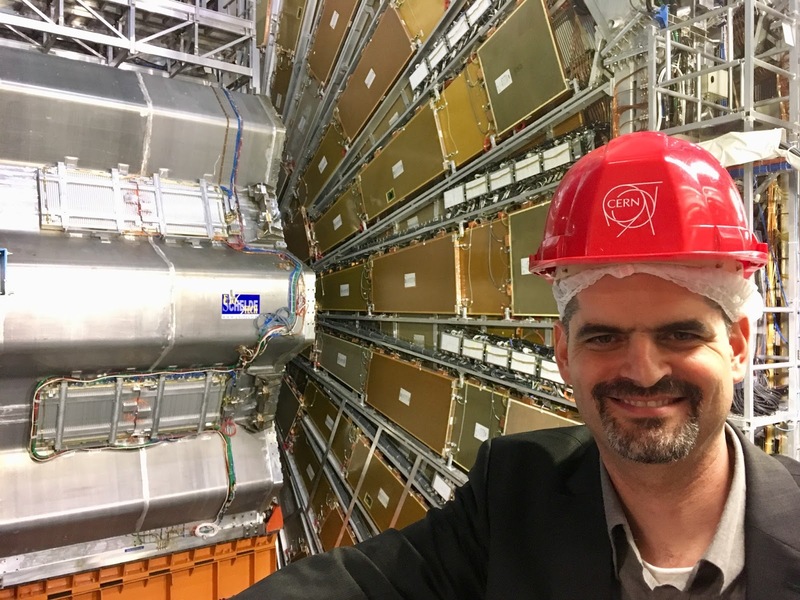 Moreover, CERN is often considered a bastion of mainstream physicalism, the metaphysics that maintains that what we call 'matter' exists fundamentally outside and independently of mind. This, of course, doesn't line up with my own views. It is probably true that many physicists and engineers at CERN hold mainstream physicalist views (though I am sure many others are entirely agnostic of metaphysics). It may also be true, for all I know, that CERN itself may sometimes unwittingly stimulate inaccurate media portrayals of its activities. But none of this contradicts or diminishes the essential fact here: what we call 'matter' is the revealed manifestation of whatever it is that lies at the ground of reality. This way, mainstream physicalists consider matter the manifestation of a quantum field, a hyper-dimensional brane, or superstrings. I, in turn, consider matter a manifestation of a field of pure subjectivity. But whichever way, studying the heart of matter gives us insight into nature's behavior at some of its most fundamental levels. This is what CERN does, and it is completely agnostic of metaphysical position; it is important work whether you are a physicalist, a dualist, a panpsychist, an idealist, or agnostic of metaphysics (this latter one is probably the healthiest position for a scientist). CERN is a place for experimental physics (only about 1% of its efforts go into theory). People there are interested in observing nature's behavior for what it is, under very special—and controlled—conditions that emulate what happened a tiny fraction of a second after the birth of our universe. Nature is their guide, not philosophical speculation. There is no place in this for metaphysical bias. 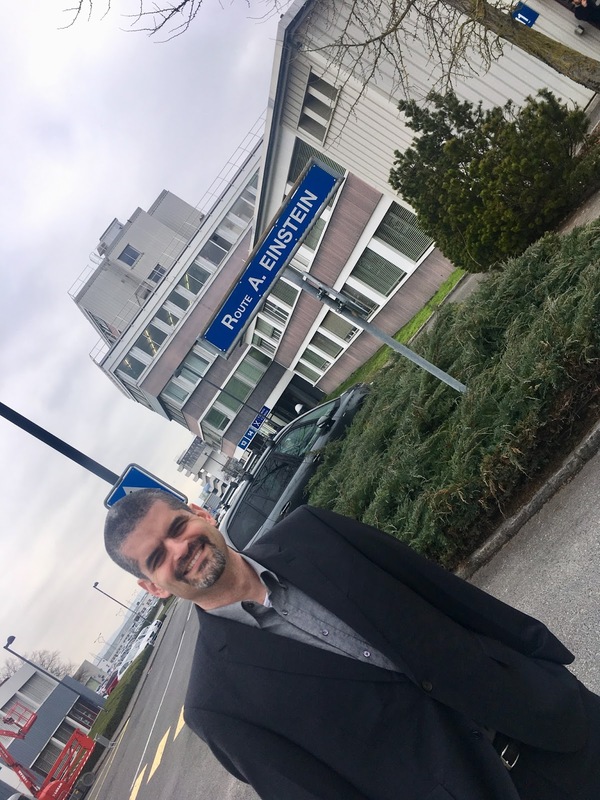 That's me on my way to building 13, where I first started working at CERN over 21 years ago. After all these years, I've had a chance this week to visit CERN again, see the places where I used to work and, for the first time, see the ATLAS experiment fully assembled and operational (I left CERN before ATLAS was completed). This was a wonderful experience, for which I am very grateful to the CERN staff who invited me over and made this happen. In a sense, I feel that a long cycle in the story arch of my life has come to completion. And yet, another cycle may be opening: for professional reasons, it is possible that I will be visiting CERN more regularly in the coming months, in an effort to help find industrial applications for CERN's knowledge and technology. I shall do it with pride, for old loves die hard, if they die at all. Hello Bernardo, I have a question, what are your thoughts on morals and empathy and how they fit into religion? Because empathy is described as a psychological phenomena, but then again that brings up consciousness and the fallacies of scientific and atheistic materialism. What is your stance? Not really related to this article... :-) Anyway, the forum is the appropriate place for this kind of discussion: https://groups.google.com/forum/#!forum/metaphysical-speculations Cheers, B.
I appreciate your thoughts and am entertaining them in the context of what I think I might already know. Tell me: Is it possible for someone to be CERN'd, that is, to be entrained with the consciousness of that giant spinner whose purpose is to find nothing, something or everything...maybe? At the moment, I am unconvinced that a bosun has participated in the CERN experiment. Et tu? If you were King of the Collider for a week (and had some time to plan) what would you do? Thanks for taking the time to share your ideas with us. I found you on Robby Berman's site.